Welcome back to my Getting Started On Google Plus mini-series. This four-part series is designed to help you learn to love Google Plus and enjoy your time on the platform. The reason Google Plus feels daunting to some people is because it's all so new and empty and quiet. That blank canvas is the perfect place to start to create a timeline that is full of two-way interesting and engaging content. If you have completed part 1 then you will now have adjusted your settings and prepared your profile so it all looks awesome and you are ready to start meeting and greeting. Now that you have some people in circles then you can start sharing content with them. It is important not to make people feel as though you are forcing them to read your updates but to tailor those updates towards the people you think may be interested in them. As mentioned in Part One of this mini-series there are a number of ways in which you can make your update visible by using the "Public", specific circles or private messaging options. I will stress that you use the "Also send email to x circles" option sporadically and only to people who you really need a response from (i.e. a small specific circle of users). Having many emails ping to your inbox during the day can feel over-enthusiastic and may lead to you being blocked. 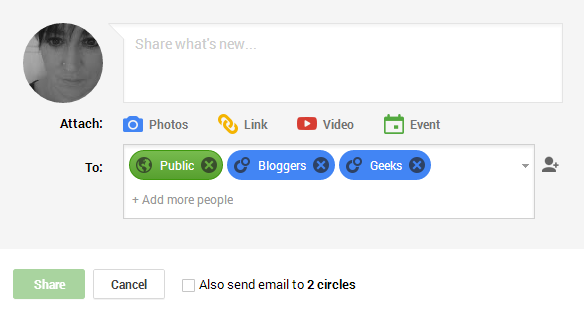 To check what the people in your circles have been saying on G+ you can view each circle as an individual stream by clicking on the circle name at the top of your G+ timeline. This means that you can allocate time to specific actions on G+ if your social media time is limited. There is a clear definition between personal profiles and brand page identities. You will communicate and interact on a profile using your own name (or the name you registered with). On a page you can choose any name or trade name to coincide with the reason for your page. Your G+ page is completely separate from your G+ profile and you can access many of the Google facilities separately (YouTube for example) using both identities. Only you (as an individual) can manage your personal profile however you can have up to 50 'managers' of a brand page and you can switch between 50 pages from one Google account. You can read more about this here. To create a G+ page you initially need a G+ profile but the connection between the two is not public. Many bloggers like to have a separate page for their blogging interaction so that they can be 'themselves' on their personal profile. There is no hard and fast rule for having the separation but it is a bonus for people who prefer to blog anonymously or under a pseudonym. To make G+ work for you you have to be prepared to invest time into either or both to make them interesting and interactive. Adding relevant hashtags to your posts will help with searches and similar posts will be grouped together. Three hashtags per interaction are recommended and there is an option in the settings for hashtags to be taken from the keywords in your update but I suggest adding your own. All hashtags are converted into clickable links and when you 'explore' a hashtag you will find related suggestions at the top of the page. Click on a G+ hashtag and see what happens. A really good one to try first is #Caturday (cat-related posts on a Saturday). You don't need to add hashtags to continuing conversations - just to the initial update. Communities are a fabulous place to use as a base for a specific topic. You can connect with people all around the world, create discussions, post photographs and arrange video Hangouts. Communities can be both pubic and private and anyone can create one. It is the responsibility of the Community owner to control the privacy settings. Community owners and members can invite people to join and you can share Find communities that you can be an integral part of rather than just leaving links to your blog or business. Here are two communities that I am a member of. Join them to get a feel for how communities work in totally different ways. Go and share some relevant content with your circles (from your profile or your page) and join a couple of communities. If you have any questions please ask me on Google Plus - I'm +Nickie O'Hara - or leave a comment below this post.